Whether it's for home cleaning or a heavy-duty job, PowRyte pressure washer is one of the go-to equipment to use. Why? Find out in this guide. Are you looking for a pressure washer? Then, you might want to check PowRyte pressure washer. It's a powerful tool that can easily remove oil, dirt, and other kinds of stains— be they a simple stain on the garage or a stubborn oil that's stuck on the walls. PowRyte is a brand that takes pride in delivering superior performance and ensuring customers' their peace of mind. It's a highly recommended product on the market. However, before you make your purchase, it's best that you read this buyer's guide and review first. With so many pressure washer brands in the market, it will be a great mistake not to objectively review each of them. As for PowRyte pressure washers, they claim to stand out above the competition. What makes them say so? PowerRyte understands the importance of saving water and energy. As part of their effort to keep their units environmentally friendly, they install Total Stop System (TSS) in their electric power washers. This system automatically shuts off the equipment when the trigger remains untouched. This allow you to save not only electricity but also water. Unlike gas-powered models, Powryte elite pressure washer is a more affordable option. It also tends to be quieter with lesser need for maintenance. What’s more is that it does not produce any fumes. Because it uses electricity, it might be less powerful than its gas counterparts. Powryte elite pressure washer reviews show that it can give up to 3000 PSI, which is something only gas-powered pressure washers can do. Now that we’re talking about motors, it’s best to mention that Powryte power washer is designed to handle massive cleaning. In other words, you don’t have to worry about it not being able to perform the task that you need to do. With at least 1.8 GPM, a Powryte basic pressure washer can be used to remove grime, moss, mold, and dirt from any surfaces. Among the many Powryte pressure washer accessories is the extra Turbo nozzle. It’s a 0-degree jet that can rotate about 360 degrees. It allows you to clean a huge amount of dirt in the shortest time. In other words, it increases the pressure washer performance by up to 50%. You can easily connect this nozzle to your Powryte pressure washer. So PowRyte elite electric pressure washer has great features. It might just have all the qualities of a good pressure washer that you need. However, is it really the equipment for YOU? 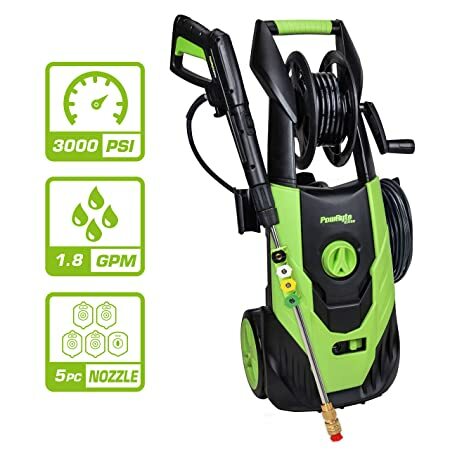 Who is the PowRyte pressure washer for? Powryte electric pressure washer 2000 PSI and other units are usually lightweight, powerful, and easy to assemble and use. Thus, you can use any of them on a daily basis. Because they don’t weigh more than 30 pounds, you can also quickly maneuver them. PowRyte pressure washers with lesser PSI are best used for domestic cleaning needs. However, Powryte elite pressure washer instructions will tell you that you can also use them for heavy commercial cleaning needs. Like other pressure washers, the Powryte pressure washer manual instructs you to keep the equipment in top condition. You need to clean the nozzles after you use them. This will save you from experiencing clogging problems. There’s a tip cleaner included in the Powryte pressure washer accessories. You can use this to remove the extra debris easily. If you are having problems with keeping the machine in its best condition, it’s best that you read the Powryte basic pressure washer manual. The Powryte elite 3000 PSI is packed with enough power needed to do almost any type of cleaning jobs. In fact, it is more powerful than most of its competitors. However, it is popular not only because of its power; it also has some of the most impressive specs. What can you expect from Powryte elite 3000 PSI? With all these specs, Powryte elite 3000 PSI is the ideal pressure washer for cleaning vehicles, home driveways, decks, etc. Find out the best medium-duty pressure washers for home use right here! Still not convinced to buy it? You might be interested to read what buyers say about the product. Before you operate the equipment, make sure to read the Powryte elite pressure washer manual. Powryte elite pressure washer can prove to be a great addition to your household. With all its features, you can get more than what you pay for. Can’t decide yet? Check out our list of the best electric pressure washers in the market today!